New York — Thornton Tomasetti announced that a team comprising Project Engineer JJ Tobolski, S.E., P.E., LEED AD BD+C, and Senior Engineer Zachary Treece of the firm’s Chicago office has won the simple category submission of the National Institute of Standards and Technology’s (NIST) Applied Technology Council (ATC) -106-1 Beam Column Blind Prediction Contest. Tobolski presented the submission and accepted the award on behalf of the team at the American Institute of Steel Construction’s (AISC) North American Steel Construction Conference (NASCC): The Steel Conference in Baltimore, Maryland, on April 13, 2018. The contest was developed as part of a comprehensive research program funded by NIST at the Caltrans Seismic Response Modification Device (SRMD) Test Facility at the University of California, San Diego. The NIST-ATC Blind Prediction Contest simple category evaluated 15 contestants on their ability to use finite element analysis (FEA) modeling techniques to construct a model that would predict response parameters of beam-column test specimens using only partial information provided by the contest organizers. 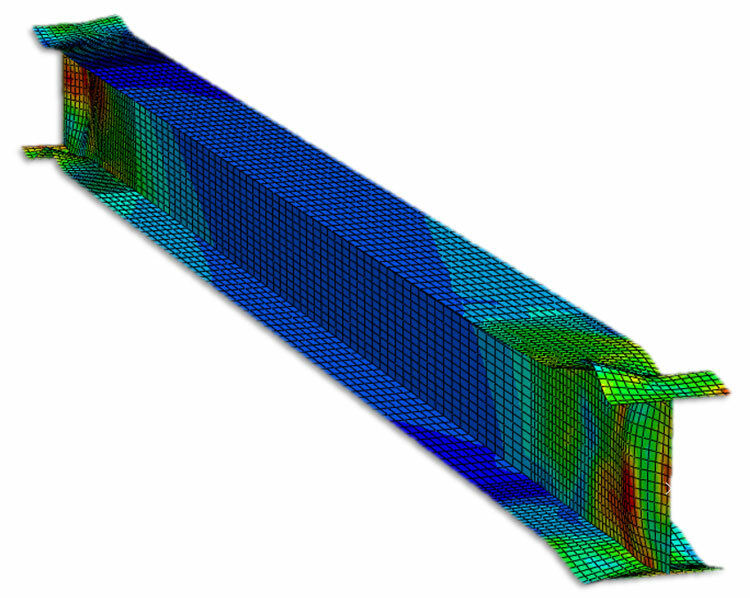 Tobolski and Treece modeled the anticipated behavior of testing samples using the analysis software Abaqus. Although the team was unfamiliar with the software prior to the contest, they were able to leverage their knowledge of other platforms and employ sound analytical skills to tackle the problem. Both team members are alumni of the University of Illinois at Urbana-Champaign, from which Tobolski received a bachelor’s degree in civil engineering and a master’s degree in structural engineering. Treece holds a bachelor’s degree in civil engineering from the University of Missouri in Columbia and a master’s degree in structural engineering from U of I. Established in 1973 through the efforts of the Structural Engineers Association of California, ATC is a nonprofit whose mission is to develop and promote state-of-the-art, user-friendly engineering resources and applications for use in mitigating the effects of natural and other hazards in the built environment.